Yeah, ok...you'll just have to forgive me for the subject line. 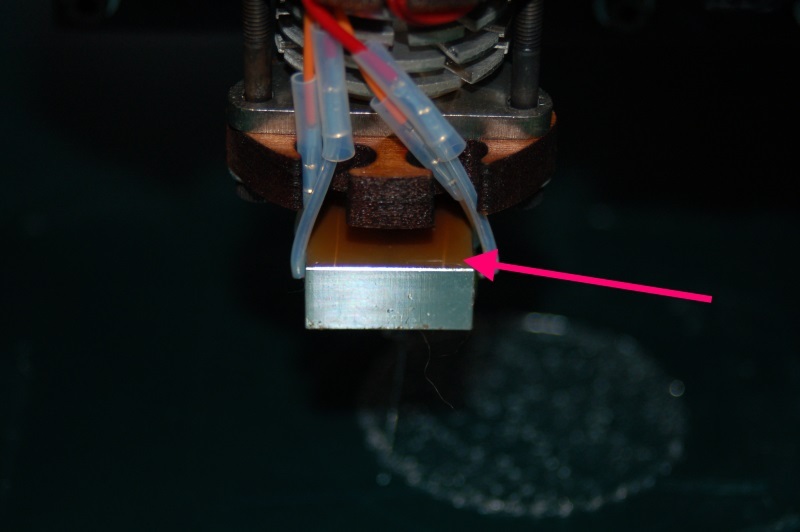 It's quite likely that you're running PLA (maybe even ABS) at too high a temperature and it's leaking out of the top of the hot end. I put my Joe Derp hat on and was running Lulzbot Translucent Blue PLA at 195C. It works for about two hours and then the heat creep jams the hot end tighter than Dibbler's[*] fist around a copper penny. Let the hot end cool down to ambient and then re-heat it to 185C or so and see how it extrudes. Run a part and see how it performs. [*] "Cut Me Own Throat" Dibbler is a recurring character in the Discworld series of books, known for his love of money and for "sausages" that could give a garbage disposal indigestion. If you didn't get the joke, fake it. Did it jam? When we discussed on IRC I thought it was just getting watery so it was too hot. Where did it jam? But ya, if your PLA is turning into water, it is too hot. We use 185C for PLA as a starting point. You could probably go lower even. The white material I used today produced a part (twisted gear vase) that squeezing would result in nearly complete layer delamination. That was at 190C. I'll try 195 and see how that works. If it fails again, I'll go back to the Translucent Blue. What white material? ABS or PLA? From where? It's the white PLA I had problems with when the TAZ first arrived. I'm getting pathetic layer adhesion, it won't stick to the bed, etc. I'm throwing the filament under the bus because I ran the translucent blue I got from here with the same .gcode, at the same hot end and bed temps after giving up on the white. Zero problems. The white is so bad that when I squeeze the model (a single wall, twisted gear vase), it just explodes into layers of plastic. What platform are you using the PLA on? I've had much more success with ABS. geneb wrote: It's the white PLA I had problems with when the TAZ first arrived.. I've also noticed that I have jamming issues with the translucent blue if I print for longer than about an hour. I did a small squirrel for my wife last night and right after tried a custom fan spacer part for a customer and it packed it in after the first layer. I'm going to retry this evening from a cold start and see how it does. I suspect the thermal break may need a fan - at least in my case. I'm running the hot end at 185C. I'm at a loss as to what's going on then. Could it be related to the over temp issue I had with the white? I figured I'd run enough of the transparent through that hot end by now that it wouldn't be an issue.